Hyperion’s Record of the Month for July sees Angela Hewitt rounding off her acclaimed series of solo Bach recordings with this delightful miscellany. A range of genres are represented—fantasia and fugues, chorale preludes, suites, a sonata, a set of variations—from different periods of Bach’s life, and displaying a wide variety of form, style, influence and scope. This is music that has been neglected largely because it doesn’t sit within the famous Bach canons rather than because of its intrinsic quality. 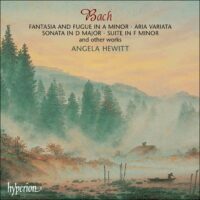 Angela Hewitt brings her customary style and elegance to these works, and her vivid, joyous music-making creates a fitting conclusion to this benchmark modern survey of Bach’s keyboard works.